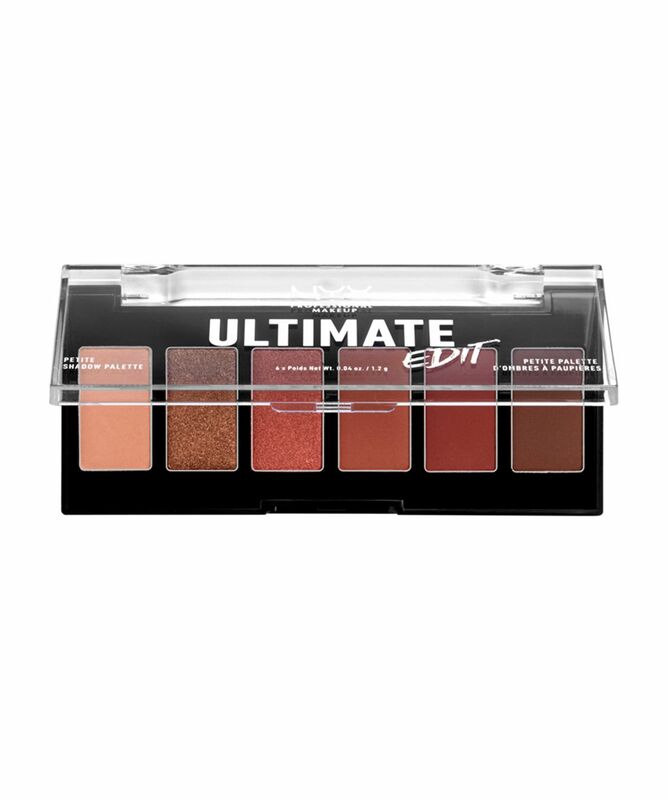 A curated collection of shadows in an adorable travel-size palette, NYX’s Ultimate Edit Petite Eye Shadow Palette stands alongside day trips and Mini Milks in proving that great things come in small packages. Baby sisters of NYX’s much-loved Ultimate Shadow Palette, Brights and Warm Neutrals are a carefully selected edit of their sibling’s best hues. Fancy something a little different? Ash and Phoenix feature an all-new combination of colours. If carrying around a palette the size of your head isn’t working out too well, you’re in for a treat. NYX have delivered dinky edits of two of their adored Ultimate Shadow Palettes, plus two brand-new travel-size colour combos. These 6-pan collections are ideal for slipping into your day bag, so you can achieve eye-catching looks on the morning commute/on the dance floor/on the walk to work – you multi-tasking dreamboat. There are four buzzworthy shade selections to choose from: ‘Warm Neutrals’ is a blend of cool matte browns and autumnal shimmers; ‘Brights’ is an all-matte selection of rainbow hues; ‘Ash’ combines velvety mattes and glitters in greys and blues; ‘Phoenix’ features a blend of fiery shades including matte reds and shimmery golds. Talc, Magnesium Stearate, Dimethicone, Hydrogenated Polyisobutene, Octyldodecyl Stearoyl Stearate, Alumina, Tin Oxide, Bis-Diglyceryl Polyacyladipate-2, Water/Aqua/Eau, Triethoxycaprylylsilane, Aluminum Hydroxide, Ethylhexylglycerin, Tocopherol, Phenoxyethanol. MAY CONTAIN / PEUT CONTENIR (+/-): Carmine (CI 75470), Iron Oxides (CI 77491, CI 77492, CI 77499), Manganese Violet (CI 77742), Titanium Dioxide (CI 77891), Mica, Yellow 5 Lake (CI 19140), Blue 1 Lake (CI 42090). <6170>G2020749 1 INGREDIENTS / INGRÉDIENTS: Talc, Synthetic Fluorphlogopite, Magnesium Stearate, Dimethicone, Hydrogenated Polyisobutene, Octyldodecyl Stearoyl Stearate, Bis-Diglyceryl Polyacyladipate-2, Ethylhexylglycerin, Tocopherol, Phenoxyethanol. Sadly, the price should have been an indication of the quality. The colours look fantastic but have poor payoff. I've resigned it to the drawer of shame after just one use. Wasted my money there. The matte eyeshadows are very blendable and they’re not chalky at all. Some of the glittery ones are not very smooth. Overall, I would recommend them. Not very pigmented but does the job. Overall a good product for the price.